Not many knew Dan Brown till his book The Da Vinci Code was released. An instant bestseller, it created an uproar in the Christian world, whipping up a storm of debate, denial and disbelief. Among other things it did, Da Vinci also changed the meaning of the term 'sacred'. Though its film version - starring Hollywood hunk Tom Hanks as symbologist Robert Langdon, and French actor Audrey Tautou - was equally criticised by sceptics, it did good business at the Box Office. Angels & Demons, Brown's little-known work written before Da Vinci, gathered steam in the aftermath of Da Vinci's success and was lapped up by fans across the globe. 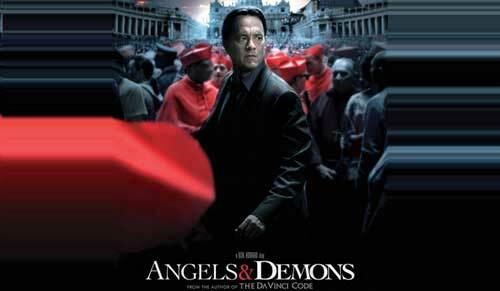 It was in Angels & Demons that Langdon was first introduced as the Harvard University symbologist who tries to uncover the mystery of the Illuminati - a secret society aiming to decimate Vatican City. Like Da Vinci, the tussle between science and religion provides the impetus to Angels & Demons as well. And now, Tom Hanks is back in the role of Langdon with a new leading lady, Ayelet Zurer, in the film adaptation of Angels, which releases in India on 29th May. Ganesha decodes the fate of this new mystery thriller directed by acclaimed film maker Ron Howard, and predicts how it will fare at the Box Office. Ascendant Lord Moon of Angels & Demons is swagruhi and is in a separating aspect with Ketu. The Moon is very close to the Ascendant. Yoga Karaka Mars is swagruhi in the 10th House. Jupiter, Lord of the Bhagya Bhuvan, is in the 8th House with Neptune. Venus is exalted in the Bhagya Bhuvan, and Vargottami is thus very powerful. In Sarvashtakvarga, there are more points in the 11th House as compared to the 10th House. In Sarvashtakvarga, there are more auspicious bindus in Houses 3, 7 and 11 as compared to Houses 4, 8 and 12. Lord Venus of the 11th House of gains is exalted in the 9th House. Retrograde Mercury is with Mars in the 10th House. As Yogakaraka planet Mars is very powerful and placed in mid-heaven, the film should receive a good initial response at the Box Office. Moon is swagruhi and Venus is exalted, and both points are favourable for a good start. However, Moon in opposition to Jupiter and Neptune, and after in conjunction with Saturn, does not augur well. Contrary to expectations, first week's business may be slightly on the downside. Again, when Moon forms an opposition with transiting Venus in the second week of its release, the film should pick up sales. Here, the positive point is that the Sarvashtakvarga is very powerful. 32 auspicious bindus in the 11th House and 26 auspicious bindus in the 10th House indicate profitable business. The only hitch is that Saturn is in the 2nd House of wealth, which will affect the overall business at the Box Office. Retrograde Mercury and swagruhi Mars in square with Rahu indicate chances of controversy. Because Mercury is retrograde, is associated with Mars and is the planet that governs the story line, some parts of Angels & Demons may be edited directly from the print. Though this is a rare occurrence, Ganesha envisages such a modification post release. In short, Angles & Demons may do well in India, but its business may not remain consistent despite it being a good film. Ganesha wishes good luck to the team of Angels & Demons!